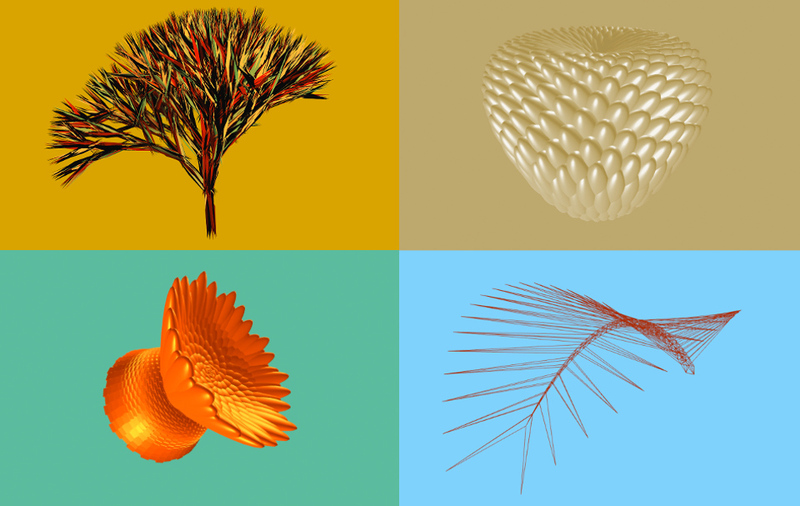 In the "algorithmic botany workshop" the participants will learn how to generate images and 3D meshes of trees, leaves and flowers. The workshop is 1 day long, the duration can be modified depending on the time available. Please get in touch if you have any other requirement or a different audience in mind. Level: Beginners, no previous programming experience required. Short Description:The workshop gives an overview on how to generate images and 3D meshes of trees and flowers. It focuses on two topics, phyllotaxis and L-Systems; exploring these two topics, the participants will discover the simple and beautiful mathematics hidden in plants. The knowledge acquired in this workshop can be applied to design, illustration, 3D printing, 3D modelling, video games. Short introduction to computer generated trees in art, design and video games, from Harun Faroki to Horizon Zero Dawn. L-System. Explanation of turtle graphics and string rewriting, overview of the grammars described by Aristid Lindenmayer in "The Algorithmic Beauty of Plants". Implementation of an interpreter for one of these grammars, generation 2D images of trees and ferns.